Well today is a better day...breath! But those bad squirrels...I love you little guys..but enough is enough.. What's the net have to say...If all else fails Shoot em...ughhh notttt!! Ok so what to do?? 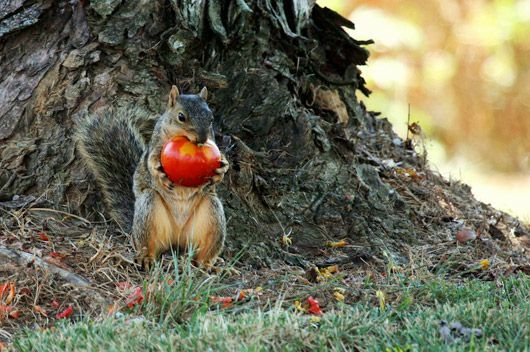 The squirrels are wreaking havoc on my garden...there favorite target my green tennis ball size tomatoes.. UGHHHHHHHHHHH...I shriek in anger, disappointment, and frustration?? I've never had so much trouble with the wildlife. Between the squirrels and the rabbits...there isn't going to be a whole lot left?? What to do? The net has a few suggestions the one I like best is the pepper tea idea, used to spray the veggies.....Although just sprinkling cayenne pepper didn't seem to deter the rabbits.So I'll have to keep you posted as to weather or not the pepper spray actually works??? Spraying the leaves and stems of hibiscus with pepper spray is one the most effective ways to keep squirrels from eating the plant. The strong scent and taste of hot pepper is unappealing to these pesky critters, so they won't be tempted to take a bite out of your plants. You can make homemade pepper spray by combining 1 gallon of water, 1 teaspoon of dish washing liquid and a small bottle of hot pepper sauce and putting in a plastic spray bottle. Commercial pepper sprays are also available specifically for keeping squirrels away from plants and gardens. If you don't want to actually spray your hibiscus plants, sprinkle cayenne pepper flakes or powder in the soil around the plants to keep squirrels away. Squirrels are also turned off by the strong scent of mothballs, so they work well to keep the pests from eating your plants. Some commercial squirrel repellents use naphthalene, the active ingredient in mothballs, to drive away the critters. If you already have mothballs on hand, you can just sprinkle a handful around your hibiscus beds. You'll have to replace the mothballs after several weeks, because they naturally lose their scent over time and the elements usually hasten that process. While you might find the scent of coffee delicious, squirrels don't. A light layer of coffee grounds around hibiscus plants can keep them from being the pests' next meal. Just sprinkle some fresh grounds on the soil surrounding the plants to keep squirrels away. Every two weeks, add a new layer of grounds. You may need to refresh the grounds more often if it has rained a lot. It may not be the most pleasant option, but blood meal can also keep your hibiscus plants safe from squirrels. A natural fertilizer, bone meal is a powder waste product from slaughterhouses. It is high in nitrogen and ammonia, and has a strong bloodlike scent that scares off squirrels. You can purchase blood meal from a nursery or garden supply store, and sprinkle it on the ground surrounding your hibiscus bed. Be careful not to over-apply, though -- use no more than 4 ounces per 1 square yard of soil. Another way to keep squirrels from eating your hibiscus plants is making them think there are predators in the area. Spraying predator urine around the hibiscus beds can trick the hungry critters into believing that other animals are in the area. Many commercial squirrel repellents use a urine-based formula, which is easy to spray on the surrounding soil. If you have a dog or cat, you can also use some of their hair to scare off squirrels. Collect it from your vacuum cleaner and sprinkle it on the soil around your plants.